Lucca is big enough to have some very good shopping. Le Sorelle, In Villa and Vittorio Melecchi have become favourites. 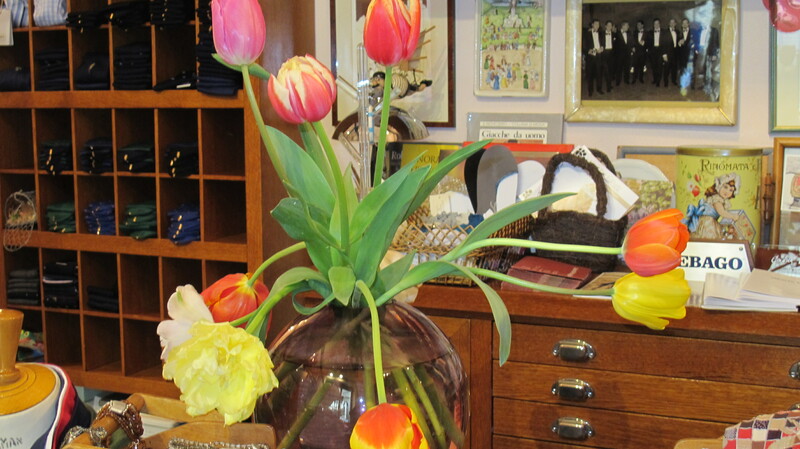 All three are staffed by their owners, and as well as having beautiful stock, the service in these shops is excellent. Le Sorelle is in Piazza Anfiteatro, the delightful oval piazza which was left behind when an ancient amphitheatre was removed. 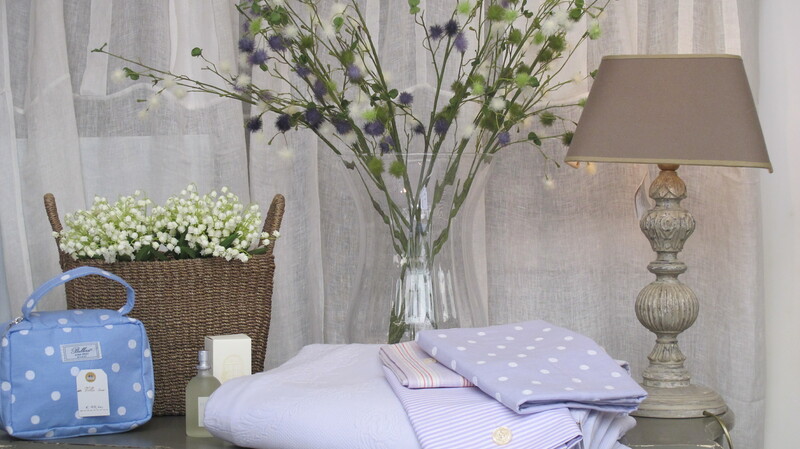 Emanuela, her husband and beautiful daughters have selected a range of colourful printed table ware, soft furnishings and lovely things for the home. 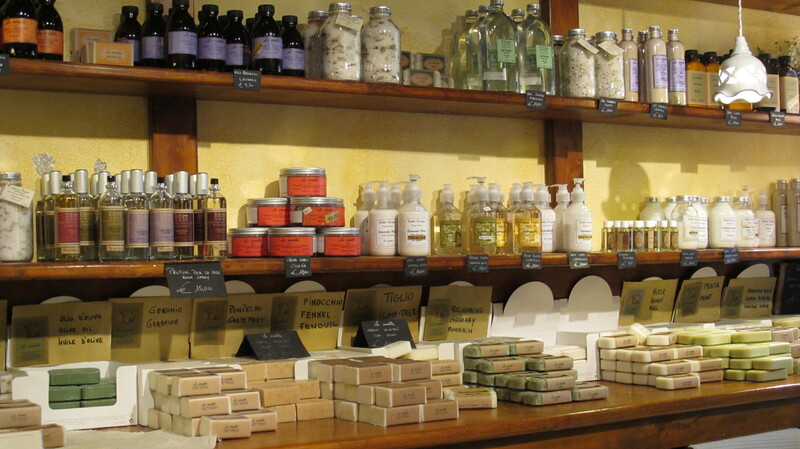 When I first moved to Bagni di Lucca, this was one of the first shops I discovered and many things have found their way into my apartments here and in Australia. 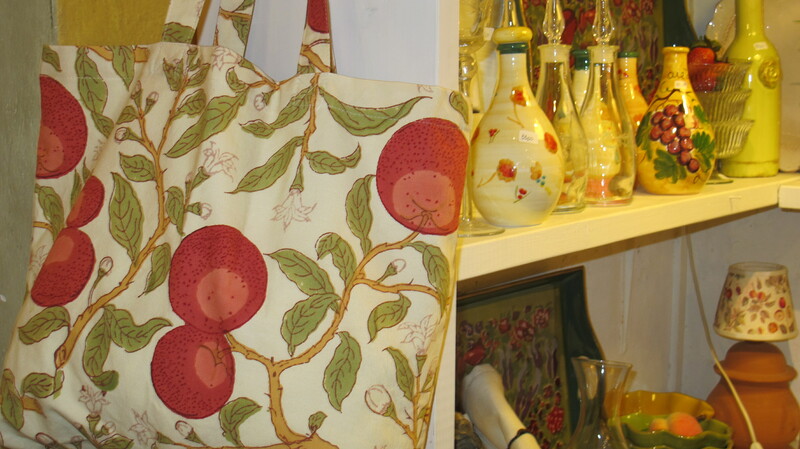 If you want to take home a beautiful and practical souvenir of Italy, this would be a great place to look. 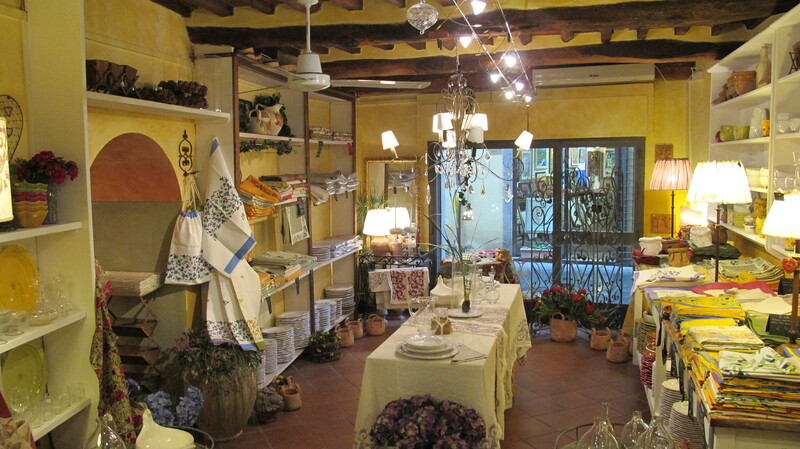 They have a lovely new shop in San Gimignano, and one in Florence, and some of their products are now available in Australia. Take a look at their website. Vittorio Melecchi is in the tiny Piazza dell’Arancio behind the clocktower in Via Fillungo. 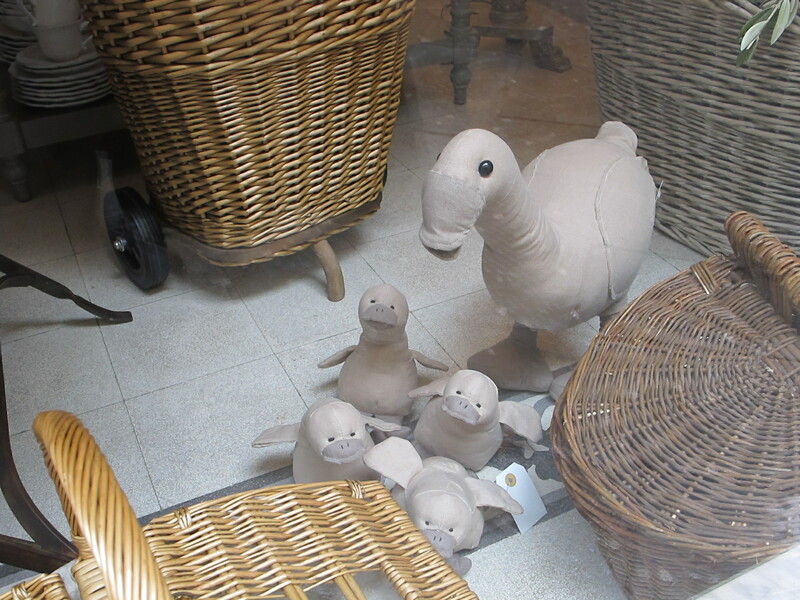 I was first attracted to this shop by its whimsical window displays. 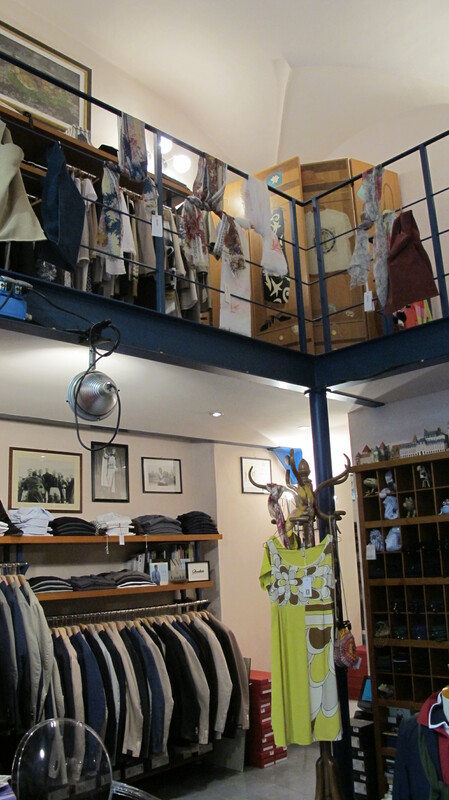 The shop carries and very interesting selection of clothes and accessories for men and women. There is Paul Smith, Kenzo, Jamin Puech and Maria Calderara accessories, Colomba Leddi and several new designers that Fiammetta, the owner likes to discover. 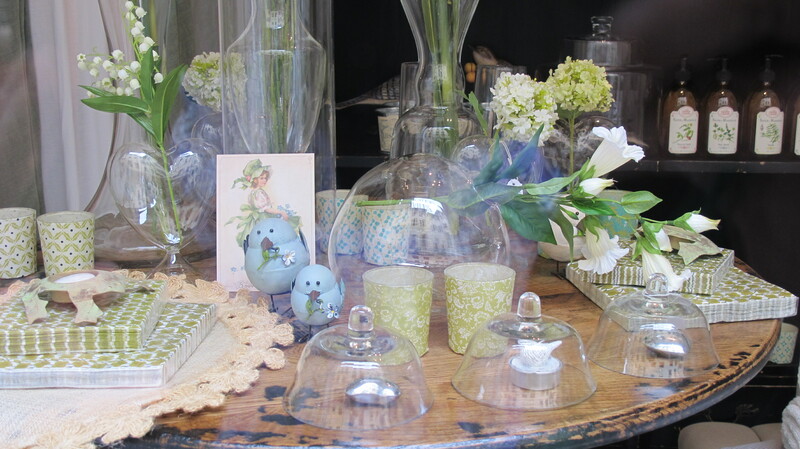 The shop is a delight to fossick through and I defy you to leave without buying something. PS. I am sorry to say that In Villa is now closed. Deb the places these blogs lead to, found the Jane Austen Bath one after scrolling to the base of your post. I like the look of the In Villa shop, colour scheme to go with my beach house. Did you do a blog of the Kimberley trip, I tried to put it in your search field. Have a friend possibly going on same company boat and wanted to send her your blog and photos. I also was in Lucca and found Le sorelle spectaular. I cannot get to their website (Service Suspended) to order some more soap and lotions. Any ideas? I sent an e-mail from their card I picked up – hopefully it will go through. I’m sure your email will go through and someone will respond. I have always found them very helpful and efficient. Let me know how you get on. Still waiting for a response on how to purchase from LeSorelle through their website. I need/want more soap!!!! 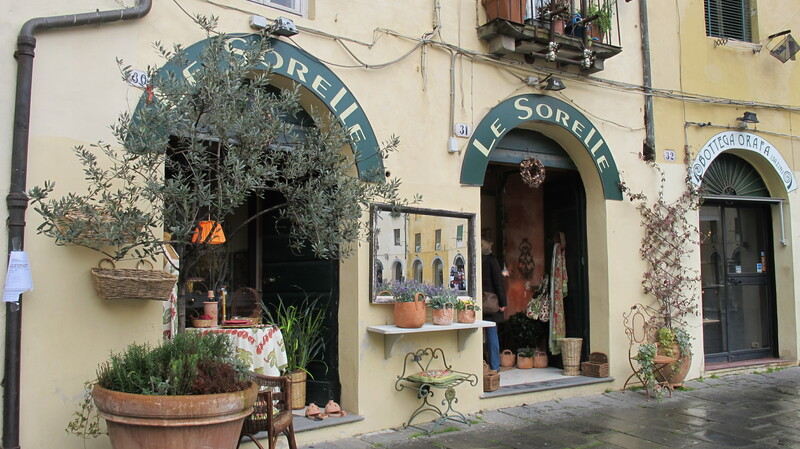 I was just in Lucca and bought some tableclothes and napkins from Le Sorelle, I would call them at 0583 48631 because ordering on their website is impossible! I gave the email and phone number to Dot, so hopefully she will have some success. 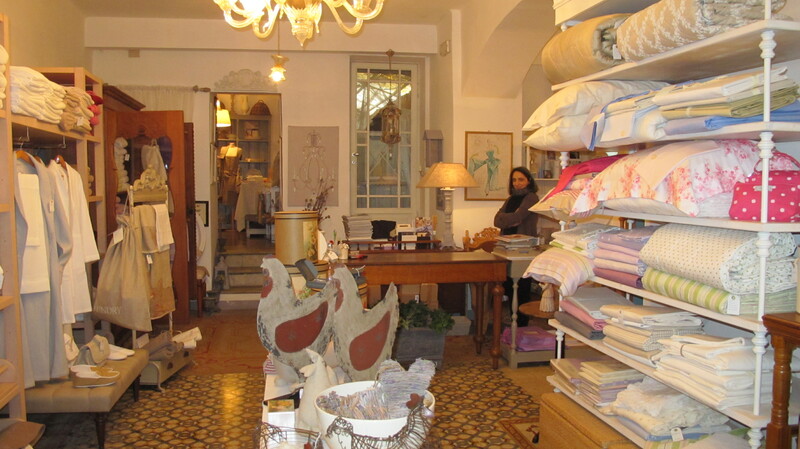 I was just checking up Le Sorelle’s website and it led me to your 2010 post, “3 of my favourite shops in Lucca”. I love this shop!!! Yesterday I bought some of their Uashmama washable paper bags to serve bread, etc; they are so cute! 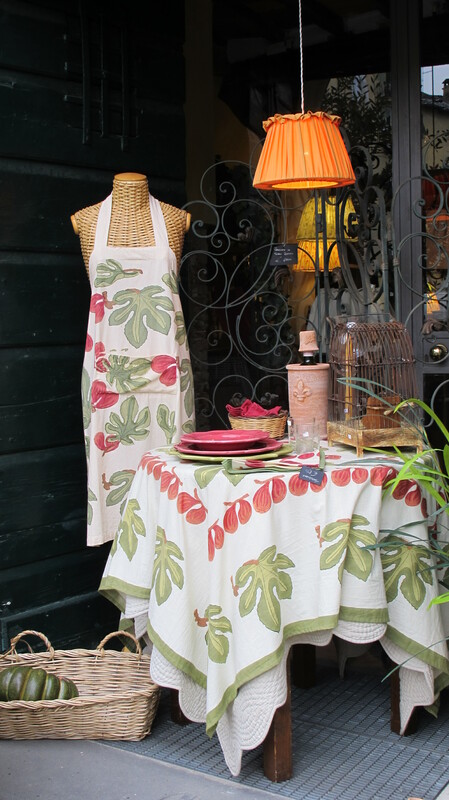 I have several of their gorgeous tablecloths, both in Australia and in Italy. I understand they export to Australia but I couldn’t find where on their website; do you know where? Have you tried L’Incontro, across the road from Ports Elisa and up a little to the right, just outside the old city? The last time I spoke to the owner of Le Sorelle, she was just finding retailers in Sydney, but I don’t know who they are. I have been to L’Incontro in Via Buia, inside the walls, but it has been many years since I went to the one near Porta Elisa. for a fantastic post and a all round entertaining blog (I also love the theme/design), I don’t have time to read it all at the minute but I have saved it and also included your RSS feeds, so when I have time I will be back to read a great deal more, Please do keep up the awesome job. 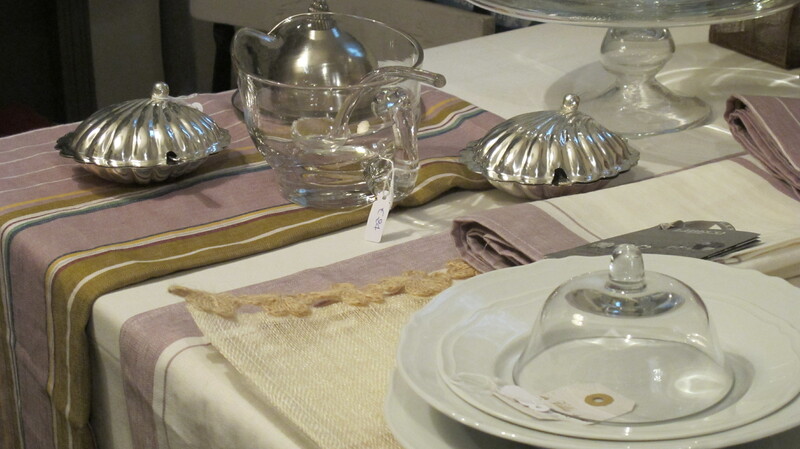 I was in Lucca on Sunday and loved le sorrelle shop in one of the windows was a table set, I loved the table cloth and the napkins etc. I didn’t buy tho and regretted it all the way back home to England :(. Yesterday a decided to try to find it on the bet. 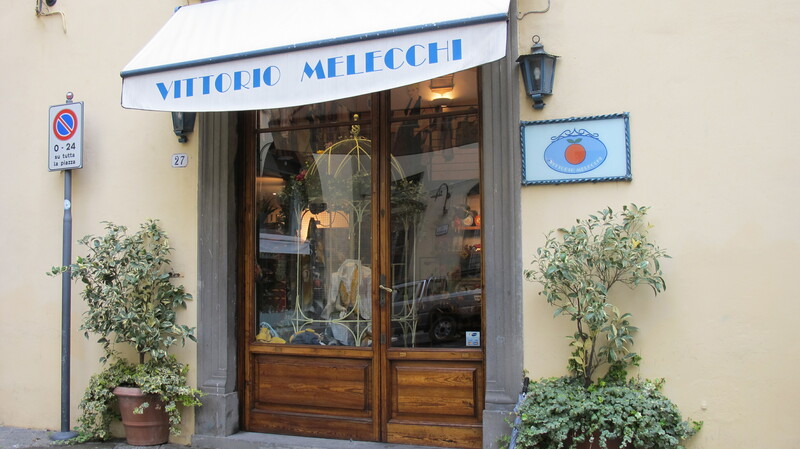 I typed in Lucca and when I saw your post “3 of my favorite shops in lucca” I wondered, what if 🙂 so when I clicked on and up came the shop I was almost screeming with excitement!! So thank you so much for that. I would never have remembered the name but the beautiful photos you posted it was the shop with out a doubt! I am now in email contact and waiting for a price 🙂 Thank you once again. It was my favorite shop too! One of the best things about Le Sorelle is the lovely family that owns the shop. You paint a delightful picture of Lucca and its tempting wares.So much so that when I visit at end of August I will make a point of seeking out the places you featured. Lucca is full of wonderful things. 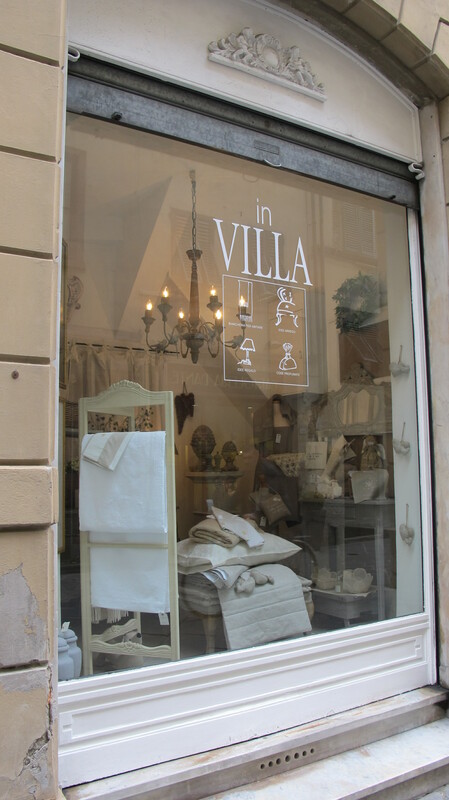 In Villa has changed hands and has a new name, but the shop is still filled with gorgeous things. Have a great time in Lucca. 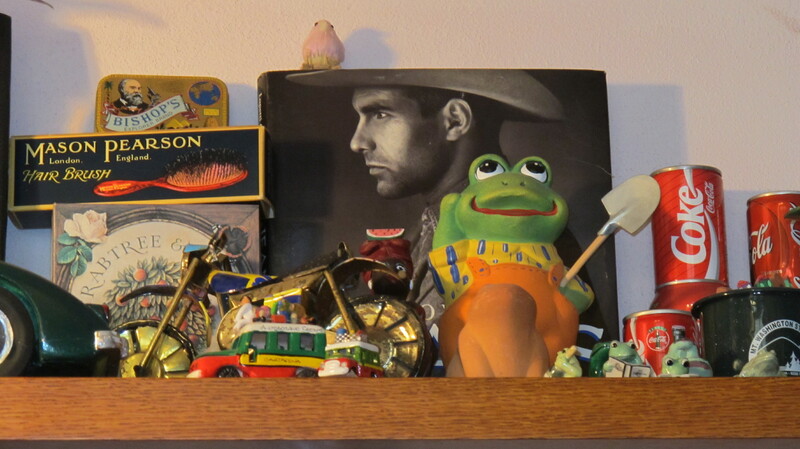 I will be back in late September…can’t wait. Your blog came up on my e-mail today………..miss Lucca – need a trip back!!! I love Lucca! I can’t wait to get back in September.